He's probably the single most influential figure in the world of mobile communications, so Mark Zuckerberg's appearance at the Mobile World Congress was always bound to be a hot ticket. But the sixty-minute session in which Facebook's founder was first interviewed by a journalist from Wired, then joined on stage by three mobile operators, was one big yawn, a missed opportunity. Okay, the subject of the session - Facebook's mission to get people in the developing world online via something called internet.org - was not, on the face of it, controversial. And Mr Zuckerberg was allowed to paint his business, in that typically happy-clappy Californian way, as motivated only by a desire to enrich more lives through an internet connection. But there are some nagging questions to be asked about internet.org. It may sound great that mobile phone users in Kenya, for instance, are getting free internet access to sites like Wikipedia, one local Kenyan news site, BBC Swahili - and, of course, Facebook. But who acts as the gatekeeper for this walled garden - and what about those other local news sites that aren't on the site and have to charge for access? And what price net neutrality in Africa? A two-speed internet has just been ruled out in the United States by the Federal Communications Commission. But the laudable mission of internet.org could end up creating fast lanes for those deemed worthy by Mr Zuckerberg and his lieutenants. 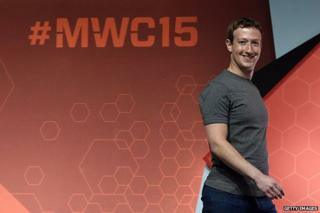 Then there's the thorny question of Facebook's relationship with mobile phone operators. It was amusing to reflect that the three mobile companies represented on the stage could probably be gobbled up for breakfast by the hugely wealthy social network without a second thought. Mobile networks are seeing their revenues threatened by messaging apps like WhatsApp, bought by Facebook a while back. Meanwhile, they are still much more heavily regulated - Deutsche Telekom's boss made a call in Barcelona for internet firms to face the same level of regulation. But on stage the mobile operators joined in the love-in, praising Mr Zuckerberg's campaign for increasing the flow of data across their networks. Facebook's founder was briefly asked about regulation. His answer, somewhat bizarrely for the chief executive of a major communications company, was that he did not understand the subject - "I'm not a regulator". He kept repeating this phrase and was allowed to laugh off the very idea that regulation was anything to do with him. The self-congratulatory session ended with little light shed on how the fractious relationship between the social network and the companies which have built the internet's infrastructure might develop. But some time soon - just as Google has already discovered - the regulators will come knocking. Mr Zuckerberg will need to have some answers then.